The country which tried to invade England in 1588 may become its best ally. After the 28 European partners held their Summit in Malta at the beginning of February, this was the Bloomberg headline regarding the relations between Madrid and London and the Spanish government’s possible stance during the Brexit negotiations. 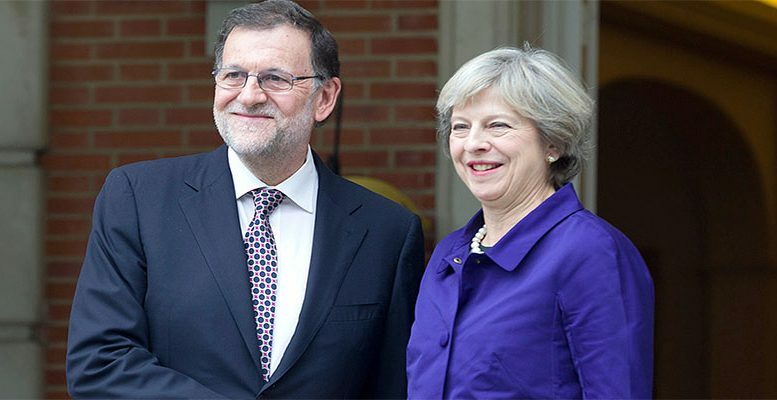 In Malta, UK Prime Minister Theresa May held a bilateral meeting with her Spanish couterpart Mariano Rajoy to analyse the strong links between the two countries. After Germany, Spain has the second largest trade surplus with the UK in the EU and the largest just the taking into account the services balance, thanks to tourism. In 2016, almost 18 million Brits, a third of the UK population, visited Spain. The deputy presidency is leading all the Brexit negotiation, coordinating with the Economy and Finance Ministries. Spain wants “a pragmatic process, we are not here to do ourselves harm,” says a government source. This stance, far removed from the “dogmatic process” which Brexit was, does not mean that Spain is going to break away from the bargaining unit headed by the European Commission, the sources explain. May will formally request the start of the disconnection with the EU by letter at end-March. In April, the rest of the European governments will agree on some basic guidelines with the community institutions and the clock will start ticking. The Commission’s chief negotiatior, Frenchman Michael Barnier, wants to finalise the exit agreement at the start of 2019 so that the European elections planned for May of that year will be held in only 27 countries. In the negotiations between London, the European Commission and the rest of the capital cities the budget will be “one of the first issues to be discussed,” one diplomatic source says. The Spanish government is studying the impact of Brexit in terms of its contribution to the European budget, “a process of reflection on the future financial outlook” already underway. “The UK is a big net contributor to the European budget, so we are going to have a hole of many billions of euros,” says this civil servant, explaining in general terms the consequences of the UK’s disconnection for its European partners. According to a report from the House of Commons, London’s net contribution was over nearly 12.5 billion euros in 2015-2016. Specificically, 10.8 billion pounds. This net contribution means the UK has financial commitments with the EU for years and the Brexit negotiations will have to quantify what the bill will be for abandoning the community ship. Initial estimates talk about 60 billion euros, which includes financial commitments to the European budget, community civil servants’ pensions and other contingencies. In parallel with the budget issue, there will also be discussions about citizenship, and the rights which European workers will have in the UK and British citizens in the other Member States. In total there are over three million Europeans living on the other side of the English Channel. According to British civil servants who were in Malta, May and Rajoy reached an early agreement on the rights of reciprocal residency for its citizens in each of the two countries. The Spanish government has denied this information, describing it as having been leaked by interested parties. The flow of people between both countries is intense. Nearly one million Britons live in Spain either permanently or on a temporary basis. And there are over 200,000 Spaniards in the UK according to unofficial figures. “The British government has always wanted to move ahead with what post-Brexit will be like,” Economy Minister, Luis de Guindos, said reproachfully after an Ecofin meeting. Only once the issues of the budget and citizenship are resolved and Brexit happens, will London be able to negotiate its future relationship with the EU to obtain a trade agreement which allows them access to the European single market. At least two more years of negotiations, a timeline which Whitehal is not convinced about. For that reason, PM May is sweet talking her European counterparts to put pressure on Brussels in favour of starting parallel negotiations, like she did with Rajoy in Malta. The government’s position is clear: “The UK is one of the most important, if not the most important country for Spain.” The negotiations will be civilised, of course, but with a knife between the teeth. London and the rest of the European capitals are facing a long chess game with economic, trade and human interests at stake. Inside the Commission, there is talk of a “political negotiation in which you have to establish your red lines from the very beginning,” according to one community source. Spain will be moving its pawns, in a harmonious way, dominating the centre of the board, without leaving itself too open and exposing its king or queen. Gibraltar is one of these valuable pieces, and the Spanish government is putting the pressure on in Brussels with respect to its future tax treatment. It’s De Guindos who is doing it, they say in the Commission. The government has not confirmed this, as it is the responsability of the Finance Ministry. The status of the British colony will be a “tricky question”, they acknowledge within the Commission. Last November, the EU Economy Ministers approved at the Ecofin meeting the criteria for finalising at the end of this year a list of non-European jurisdictions which don’t collaborate in the matter of taxes. Spain would have liked, in terms of transparency, “for the approximation to be much stricter” and put pressure on in this meeting for ” a transitory period to define when a jurisdiction is non-collaborative, when it constitutes a tax haven.” After Brexit, it looks very much like Gibraltar will be added to the list and considered a tax haven. Spain considers it “extremely important that these jurisidictions do not favour the creation of offshore accounts, that’s vital,” Luis de Guindos said after the Ecofin meeting. “The inclusion of Gibraltar in the list of tax havens will be later,” after Brexit, diplomatic sources consulted explain. If Spain wants to pressurise the UK during the negotiations over the opaque bank accounts in Gibraltar, it won’t be easy. Gibraltar has signed an extensive code of tax conduct to bring itself in line with EU regulations; in fact, 60% of its laws are based on the community law, including the EU Savings Directive. This obliges the Gibraltar authorities to provide information to the EU finance ministries about the interest or dividends which European citizens obtain from their deposits in these savings accounts.